The Doll Forum • View topic - Sept 2018 Cat E Mini Challenge "Playing with Frank's Doodle"
Sept 2018 Cat E Mini Challenge "Playing with Frank's Doodle"
Post subject: Sept 2018 Cat E Mini Challenge "Playing with Frank's Doodle"
Well, we were moved from our regular classroom to this smaller area... In fact, it feels suspiciously like a utility closet. Sigh, thank goodness we're tiny so we can all fit inside here! Now that we're all together, I thought I'd ask Frank to take out his doodle and show it to everyone. Frank, would you be so kind? That's a fantastic doodle! May we see another? There is enough detail to focus our attention, but nothing is belabored. There is a strong sense of mass and movement. Light and shadow sculpt forms and guide the viewer. We are given just enough background information to establish context. Frank has taken his subjects and stripped them down to their most essential elements. Similarly, effective photography is the art of removing unimportant information. 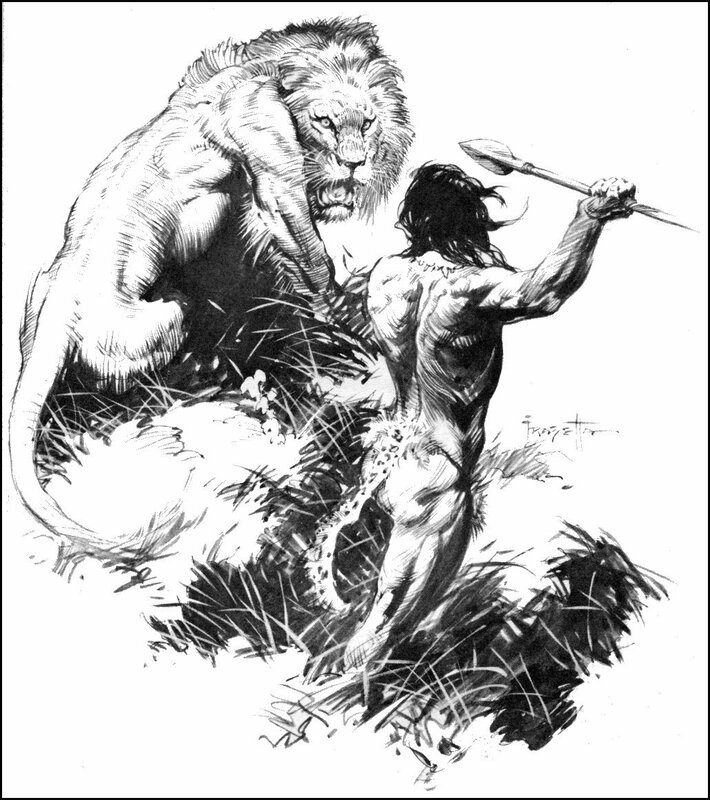 This month, we're going to apply the principles of Mr. Frazetta's sketches to our minis. Do you think you can create an exciting image using a focused, minimalist approach? Craft a dynamic image using the least amount of visual information. Communicate a dramatic sense of movement / visual tension. Effectively use light to suggest mass and create visually pleasing forms. Suggest sense of place through minimal use of props, forms, etc. This month's challenge will run until the evening of September 26. Please submit your entries before this date. Voting will open ASAP on the 27th when the Poll is completed and will run 3 days until the evening of September 29. This is an awesome photo, the depth of field is spot on! Playtime, you need to check out Zed’s threads! Awesome photos and stories! Anyway, very, very interesting theme Zed! It’s going to take a bit of thinking to come up with something on those lines! It’s going to be a ‘challenge’! Hey zedoh, I was looking for Frank's little doodle, and realized he doodles... Lol Very interesting theme!! Congrats on the win man, always love your work!! OK, I had a little play today and took Claudette and Kaia out in the sun on a white board! I was just starting to do some shoots when one of my neighbours came up and asked what I was doing! I was caught off guard to say the least trying to explain why I was taking photos of naked Phicens and what they were in the first place! Ah well, it's all in the game I suppose! "Claudette and Kaia" in "Down Now!" It started off as this image as taken (complete with bits of grass on the board!)……. I then used PhotoScape to clone stamp out the bits of grass and blend in their wrists, GIMP to scale the image and Paint.net to produce an ink sketch! Whilst this is not a photo manipulation category, I felt the altered image fits the brief more than the original. I am confused...Is this now the special effects contest? Or are we suppose to draw pictures of our dolls (or stick figures I guess) or use photo shop???? 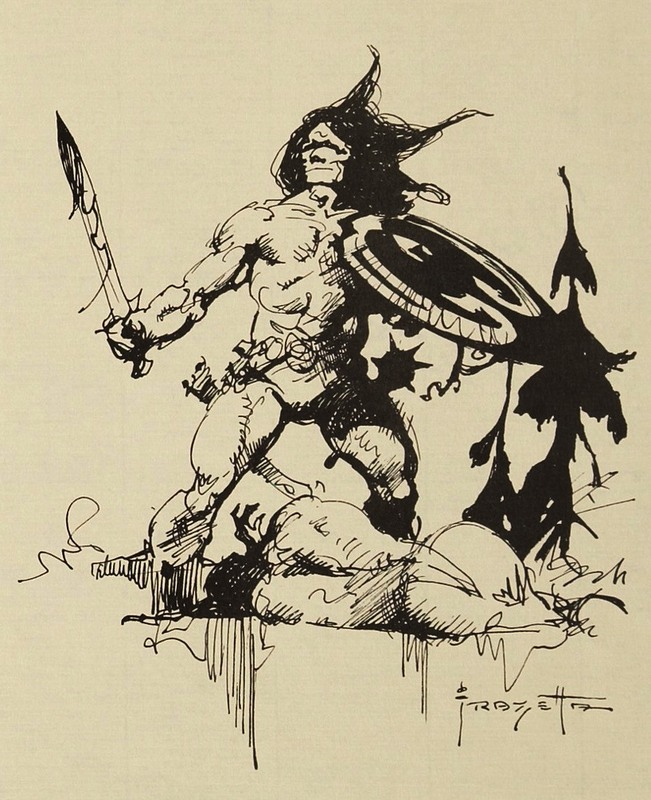 I also love the art work of Frank Frazetta, in fact he is my favorite artist and started me on my life long love of Fantasy and Science Fiction! Just my 2 cents, but I think the unaltered image looks better, H+F. Thanks for the comments guys, I’ve edited it so the original (slightly cleaned up) is the main entry. I did do a black and white version but again that’s editing! I agree that there shouldn’t be extensively edited versions in this category as Cat D is the place for that! 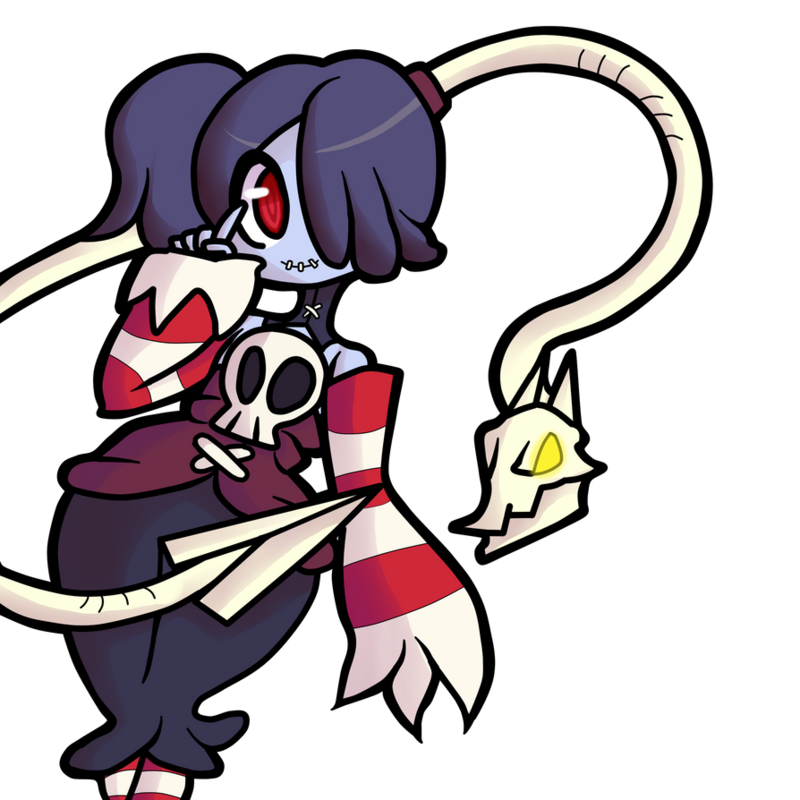 Hi Hollows, Claudette & Kaia! Thank you for courageously jumping first into this challenge! I particularly loved the wind frazzled hair. 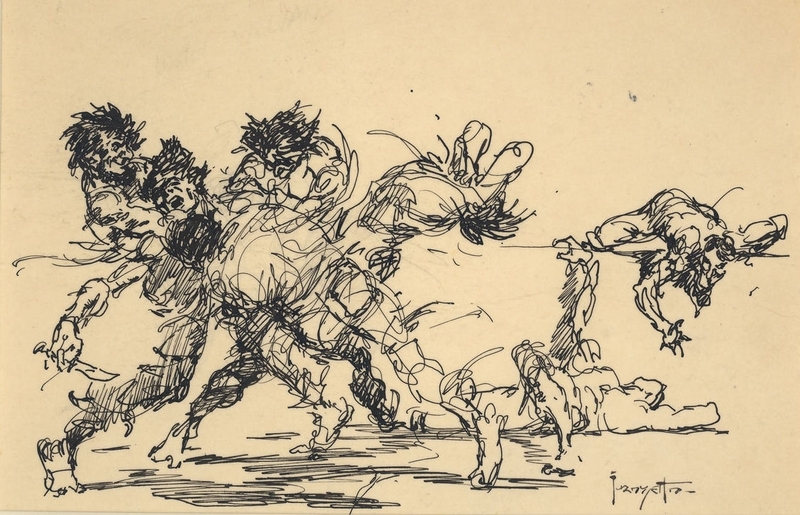 It was a trademark of Frank's disciplined yet energetic line work. Your entry demonstrates a keen comprehension of the brief. Through precise use of minimal elements, you have crafted a dramatic image that is visually interesting. Particularly noteworthy is your use of shadow to connect the figures to each other and echo the tension in the image. Although it is not necessary to mimic the look of a drawing in order to fulfill the requirements of the challenge, using methods like desaturation, sharpening lines and consolidating the color palette can punctuate an image, increasing its visual effectiveness. It is also be helpful to find creative uses for shadow and light. Silhouetting and blowing out details are both powerful ways to simplify and abstract a form. Thanks Zedoh! I knew the sun would produce the shadows I wanted but last time I took photos of two contrasting skin types of the Phicens (tan and pale) in the sun the pale skin blew out of focus so using the white board helped the camera focus on the pale skin of Kaia. The result was as I’d hoped! We’ll see how the rest of the challenge entries go and maybe choose which one is more suitable maybe! Hello, Lone Ranger & Death Dealer! Wonderful use of a limited color palette. Violet-soaked hues bleed ominously into pitch black darkness, drenching the image in a eerie, monochromatic treatment. The lighting detail around the steed is particularly beautiful. The horse's gaze and sinewy details are stunning. At first, I had no clue what to do for this challenge. Then on Saturday, before I mowed, I always walk my yard to make sure and pick up any sticks, etc. that might damage my mower. I found something unusual this time, and as soon as I found it an idea came to me to do. As you can see from the set-up photo (included below the entry), it was an Army guy in the prone firing position. Now I knew that since it is not articulated, it could not be the focus of the shot, that I would need to minimize the use, while still getting the effect I wanted. If the use of him at all disqualifies the photo, please let me know, it is not a problem. Editing: Crop, conversion to B&W, and a blood spatter brush. A special thank you to Hollows for his explanation as I had some whiteboard laying around that I could use. This is a very creative use of light to distort the scale of an object and intensify its visual significance within the composition. There is a wonderful tension and balance throughout the image. You made excellent choices in cropping, aspect ratio and subdividing your photo into zones with contrasting tonal ranges. Thank you for including the "behind the scenes" image. It demonstrates how a simple set up can transform into a compelling image through the photographer's choice of lighting and compositional skills.